Men can recover and make up after a head-on conflict while women cannot. What happens when you place eight 4-year old’s in a room and ask them to decide who is going to be the leader? Being aware of the feminization of men/boys so you can call into question your beliefs on this topic. Why is it so hard for women to “reconcile” after a fight? 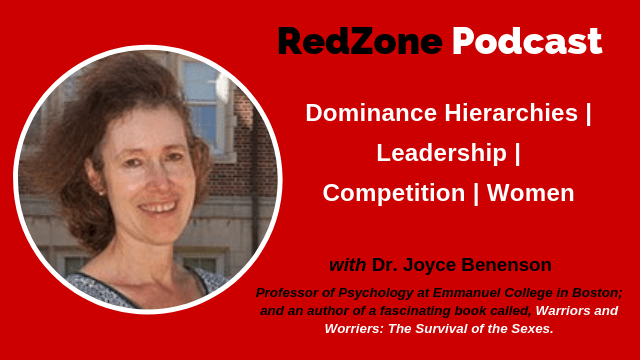 Dr. Joyce Benenson is currently a professor of Psychology at Emmanuel College in Boston and an Associate Member of the Human Evolutionary Biology department at Harvard University. She has studied children’s interactions since she was 19 as an undergraduate at Duke University. After obtaining her Ph.D. from Harvard University in 1988, she was a post-doc at Radcliffe College, an assistant professor at the University of Hartford, an assistant/associate professor at McGill University in Montreal, Canada, and a reader in Ethology at the University of Plymouth in England before her current positions. Warriors and Worriers: The Survival of the Sexes, by Dr. Joyce F. Benenson, Henry Markovits, and Coleen Marlo. Emmanuel College Profile and list of publications. No Hard Feelings, Article from The Economist, 2016 that talks about a theory by Joyce Benenson that reconciliation after competition is more a masculine than a feminine trait. Men may have evolved better “making up” skills, Article from BBC News, 2016 that discusses Men’s historical dominance of the workplace may, in part, be because of their ability to reconcile with enemies after conflict, a new study suggests. Gender predicts how athletes interact after game, Reuters.com article, 2016 talks about a study of four sports that showed that male pro-athletes may linger on peaceful or even loving touches after a match, while female athletes don’t tend to embrace as heartily.